"We first requested the IAAF to review Oh's national team eligibility in December 2018, but it told us to submit additional documents that can prove his residential history in South Korea,"
Oh Chang-seok said. "So, we submitted notarized documents from Cheongyang County Governor and his lawyer, and we passed the status reexamination." Previously, athletes who hadn't represented their native country only had to wait one year to compete for their adopted country. But Chang-seok thought that Oh's case could be subject to review. 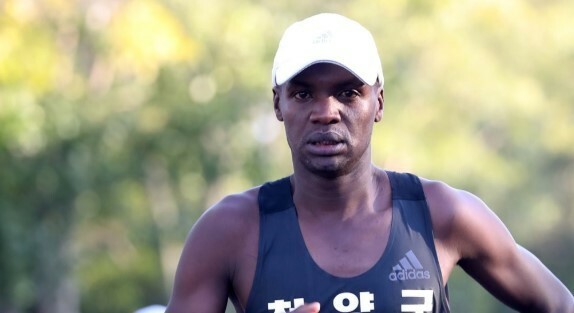 After Oh completed his naturalization process, with help of the Korea Association of Athletics Federations, he requested the IAAF to reexamine the case. "Oh has been affiliated with Cheonyang County (in South Chungcheong Province) since 2015 and he has only been competing in marathon events in South Korea," Chang-seok said. "We emphasized this history to the IAAF and it took a long time for the IAAF to recognize." "When Oh first heard that he can represent South Korea starting in 2021, he looked disappointed, but now he can work hard with high motivation," Chang-seok said. "Oh's wife and his children in Kenya will also come to South Korea." Although Oh will be able to run for his adopted country at the Olympics, there are still other issues to overcome. According to the KAAF, recognizing Oh's record as a South Korean's is another matter. "The IAAF recent decision on Oh's national team eligibility is something of an exception," a KAAF official said. "There is the possibility that we can discuss Oh's records in the future, but at this point we will accept three-year probation period on Oh's records."